I am often asked by growers and processors to recommend a thermostat for a greenhouse, cooler, or postharvest process use. There are many to choose from and their specifications can be confusing. It is important to remember just what a thermostat does. It is essentially no different from the light switch on the wall with one very significant exception. Instead of depending on a person to switch it from ON to OFF, we use a temperature measurement. The accuracy of both the temperature setpoint (what you set) and the actual temperature (what the actual condition is) can be critical for production quality and energy efficiency. An output indicator (e.g. a light) that tells you whether the load is being turned on or not (or, rather, that the thermostat switch is closed (ON) or open (OFF)). 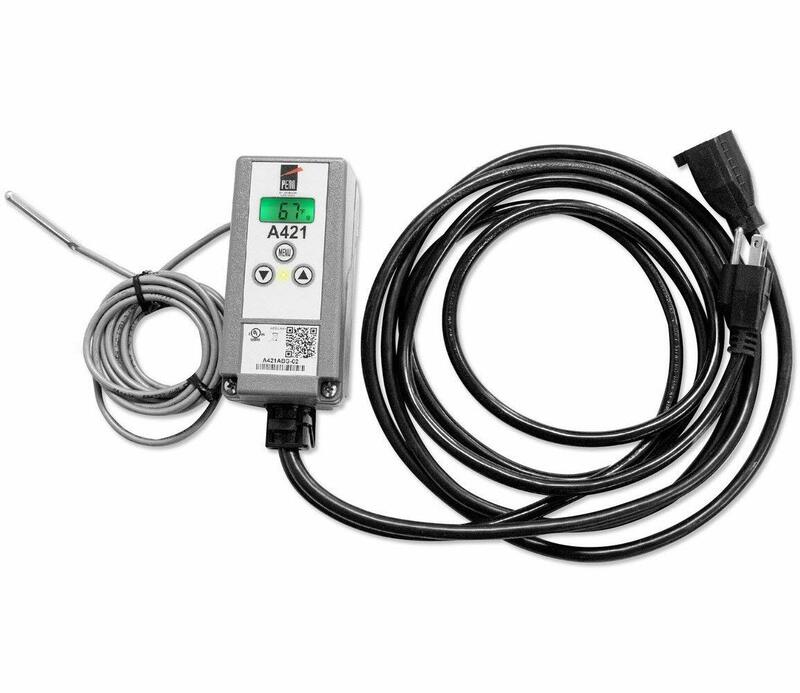 A remote probe that allows you to place the control unit where it is convenient to read and use and the probe where the temperature condition should actually be measured. The ability to add probe lead length should also be considered, and most sensor probes can be extended with thermostat wire up to 200 feet. A remote bulb also allows to you also move the temperature measurement point as needed. For example, you can use it to control a greenhouse bench heat system early in the spring for seedlings, then as an air temperature sensor later for tomatoes and perhaps even as a soil temperature sensor in conduit for winter growing. A remote bulb can be very helpful in food processing applications to allow temperature measurement at the center of a tank in one room with the control panel in another room. Accurate measurement over a wide range of temperatures ideally with the ability to calibrate it in the field, +/- 2 degF accuracy over a range from 32 deg F to 212 deg F is possible. Low differential ability, which sets the difference between turning on the load and turning it off, 1 degF differential is possible. Ability to change mode, i.e. be switched from cooling use (run a refrigeration compressor on increasing temperature) to heating use (fire a heater on decreasing temperature). This allows for standardization of thermostat on the farm and in the processing plant and the ability to move a thermostat to a different, more urgent use depending on the season or need. 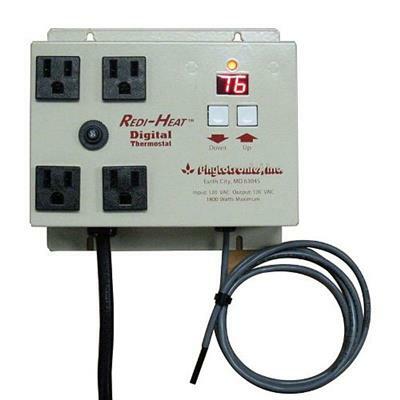 Compatible voltage and amperage with the intended load, or allowance for a relay if needed. If the load is controlled with 24 VAC (some furnaces) then the thermostat should be intended for 24 VAC. If the load is intended for 120 or 240 VAC this will generally be a different model. Also be sure to check the current ratings. 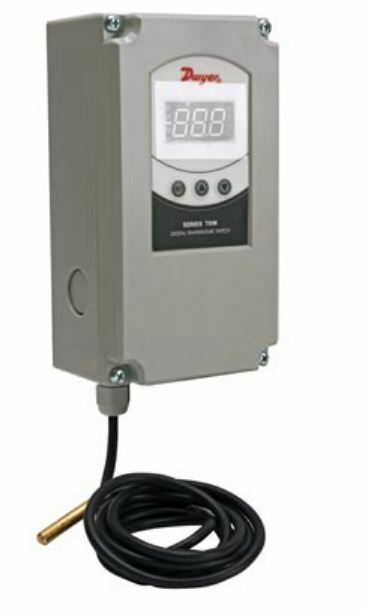 The DuroStat can control up to 4.5 HP (120 VAC, 30 A), Johnson Control up to 1 HP (120 VAC, 16 A), Ranco 1 HP (120 VAC, 16 A). 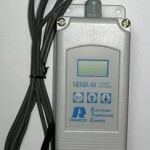 An external relay can be added into the circuit to increase the load capacity. Does a two stage thermostat make sense? I.e., two stages of heating to control two different heaters as needed based on two “staged” setpoints. For example, a single greenhouse may have a design heating load of 350,000 BTU/hr to maintain 65 deg F . Most of the year a single 200,000 BTU/hr heater does this on a thermostat stage set for 65 degF. But on very cold days or nights a second stage set for, perhaps, 63 degF would bring a second 150,000 BTU/hr heater on to help with the load. Does it make sense to use two thermostats? This is common practice to control a heater and ventilation fans. Generally, one thermostat is set up for cooling/ventilation and the other one is set up for heating. You can also accomplish two-stage heating with two thermostats set at different setpoints. Consider the enclosure you need. If this is for a typical agricultural location (e.g. greenhouse, cooler, pack house, barn) a NEMA Type 1 enclosure should be fine, if the installation area for the control box is regularly subject to direct wash water, dirt, dust or other foreign matter a NEMA 4x enclosure may be warranted. This provides some protection against personnel hazard, intrusion of foreign matter and water. Should you consider pre-wired thermostat with a normal plug to control an appliance that generally plugs into a wall. These can be helpful for turning an on/off or 0-100% dial control heater into a truly temperature controlled heater. Any thermostat can be wired this way, but for those who really prefer to avoid electrical wiring, pre-wired options are available. Johnson Control A421 – The A421 replaces the prior A419. Almost any local plumbing supply house like F.W. Webb, etc. In terms of location in a greenhouse, I suggest locating the probe centrally to control air temperature, horizontal air flow (HAF) fans will circulate and mix the air to “average” it out. But, as noted above, if you are controlling for bench temperature or soil temperature, then other locations are more appropriate. If you have other thermostats you’d like to see listed and/or have other things you consider when selecting them please let me know.